Need a guitar repair? We restring guitars, do set-ups and other work on fretted instruments. 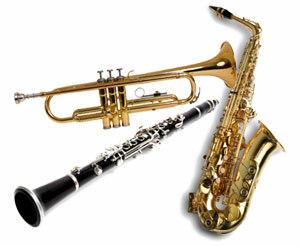 We also offer a wide variety of repair services on all band and orchestra instruments, whether it be a complete overhaul and repadding of your flute, saxophone, or clarinet to put it back in top condition, or just a minor adjustment such as fixing a bent key, replacing a missing cork, or getting a dent out of your trombone's slide. Whatever is needed, we will let you know and give you and estimate before the work is done. We do autoharp tuning and repair. Contact us for further information and/or estimates. Estimates will be given before the work is done. Call 818-244-7608 for repairs.